Archaeologia: or Miscellaneous Tracts relating to Antiquity. Volume 2, 1773. 1773. First Edition, Disbound. Very Good Condition. 10 pages + 3 plates, some foxing. Note; this is an original article separated from the volume, not a reprint or copy. Size: Quarto. Quantity Available: 1. Category: Archaeologia; Printed before 1800; Inventory No: 156643. Archaeologia: or Miscellaneous Tracts relating to Antiquity. Volume 4, 1777. 1777. First Edition, Disbound. Very Good Condition. 4 pages, some foxing, Note; this is an original article separated from the volume, not a reprint or copy. Size: Quarto. Quantity Available: 1. Category: Archaeologia; Printed before 1800; Inventory No: 156731. Archaeologia: or Miscellaneous Tracts relating to Antiquity. Volume 23, 1831. 1831. First Edition, Disbound. Very Good Condition. 6 pages with 3 illustrations + 1 plate, some foxing. Note; this is an original article separated from the volume, not a reprint or copy. Size: Quarto. Quantity Available: 1. Category: Archaeologia; Inventory No: 157650. Archaeologia: or Miscellaneous Tracts relating to Antiquity. Volume 23, 1831. 1831. First Edition, Disbound. Very Good Condition. 7 pages + 2 plates, some foxing. Note; this is an original article separated from the volume, not a reprint or copy. Size: Quarto. Quantity Available: 1. Category: Archaeologia; Inventory No: 157651. Archaeologia: or Miscellaneous Tracts relating to Antiquity. Volume 32, 1847. 1847. First Edition, Disbound. Very Good Condition. 8 pages, some foxing. Note; this is an original article separated from the volume, not a reprint or copy. Size: Quarto. Quantity Available: 1. Category: Archaeologia; Inventory No: 157784. Archaeologia: or Miscellaneous Tracts relating to Antiquity. Volume 31, 1846. 1846. First Edition, Disbound. Very Good Condition. 13 pages, some foxing. Note; this is an original article separated from the volume, not a reprint or copy. Size: Quarto. Quantity Available: 1. Category: Archaeologia; Inventory No: 157834. Archaeologia: or Miscellaneous Tracts relating to Antiquity. Volume 20, 1824. 1824. First Edition, Disbound. Very Good Condition. 5 pages. Note; this is an original article separated from the volume, not a reprint or copy. Size: Quarto. Quantity Available: 1. Category: Archaeologia; Inventory No: 197563. Archaeologia: or Miscellaneous Tracts relating to Antiquity. Volume 23, 1831. 1831. First Edition, Disbound. Very Good Condition. 6 pages with 3 illustrations + 1 plate, some foxing. Note; this is an original article separated from the volume, not a reprint or copy. Size: Quarto. Quantity Available: 1. Category: Archaeologia; Inventory No: 197629. Archaeologia: or Miscellaneous Tracts relating to Antiquity. Volume 23, 1831. 1831. First Edition, Disbound. Very Good Condition. 7 pages + 2 plates, some foxing. Note; this is an original article separated from the volume, not a reprint or copy. Size: Quarto. Quantity Available: 1. Category: Archaeologia; Inventory No: 197630. Archaeologia: or Miscellaneous Tracts relating to Antiquity. Volume 31, 1846. 1846. First Edition, Disbound. Very Good Condition. 13 pages, some foxing. Note; this is an original article separated from the volume, not a reprint or copy. Size: Quarto. Quantity Available: 1. Category: Archaeologia; Inventory No: 197811. Archaeologia: or Miscellaneous Tracts relating to Antiquity. Volume 32, 1847. 1847. First Edition, Disbound. Very Good Condition. 8 pages, some foxing. Note; this is an original article separated from the volume, not a reprint or copy. Size: Quarto. Quantity Available: 1. Category: Archaeologia; Inventory No: 197846. Archaeologia: or Miscellaneous Tracts relating to Antiquity. Volume 2, 1773. 1773. First Edition, Disbound. Very Good Condition. 2 pages, some foxing. Note; this is an original article separated from the volume, not a reprint or copy. Size: Quarto. Quantity Available: 1. Category: Archaeologia; Printed before 1800; Inventory No: 250681. Archaeologia: or Miscellaneous Tracts relating to Antiquity. Volume 2, 1773. 1773. First Edition, Disbound. Very Good Condition. 10 pages + 3 plates, some foxing. Note; this is an original article separated from the volume, not a reprint or copy. Size: Quarto. Quantity Available: 1. Category: Archaeologia; Printed before 1800; Inventory No: 250729. Archaeologia: or Miscellaneous Tracts relating to Antiquity. Volume 13. 1800. First Edition, Disbound. Very Good Condition. 4 pages, and 2 double folding plates. Note; this is an original article separated from the volume, not a reprint or copy. Size: Quarto. Quantity Available: 1. Category: Archaeologia; New Arrivals; Inventory No: 250760. 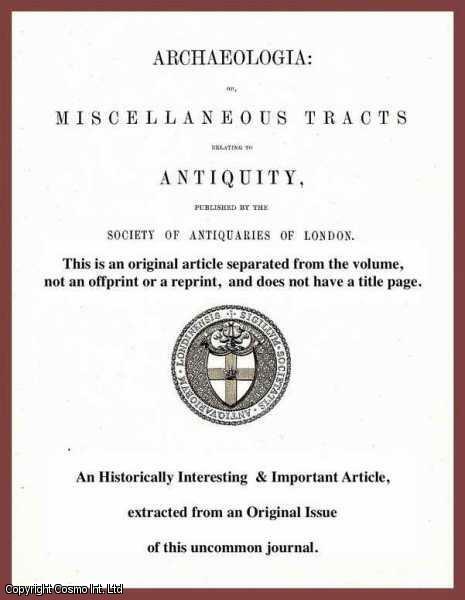 Archaeologia, or Miscellaneous Tracts relating to Antiquity. Volume 39, 1863. 1863. First Edition, Disbound. Very Good Condition. 3 pages + 1 plate, some foxing. Note; this is an original article separated from the volume, not a reprint or copy. Size: Quarto. Multiple copies available this title. Quantity Available: 2. Category: Archaeologia; Inventory No: 156397. 1800. First Edition. Very Good Condition. Note; this is an original article separated from the volume, not a reprint or copy. Size: Quarto. 1 pages. Quantity Available: 1. Category: Archaeologia; Special Interest; Featured; Inventory No: 239927. Arthur's Stone,a Cromlech in the District of Gower. 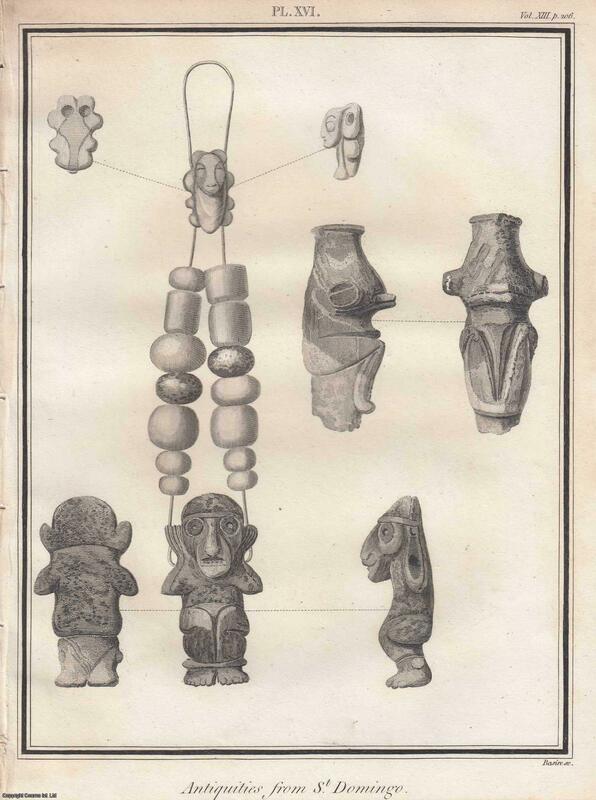 A rare original article from the journal Archaeologia, 1831. Archaeologia: or Miscellaneous Tracts relating to Antiquity. Volume 23, 1831. 1831. First Edition, Disbound. Very Good Condition. 6 pages + 1 plate, some foxing. Note; this is an original article separated from the volume, not a reprint or copy. Size: Quarto. Quantity Available: 1. Category: Archaeologia; Inventory No: 197652. Of the Borstal Horn. 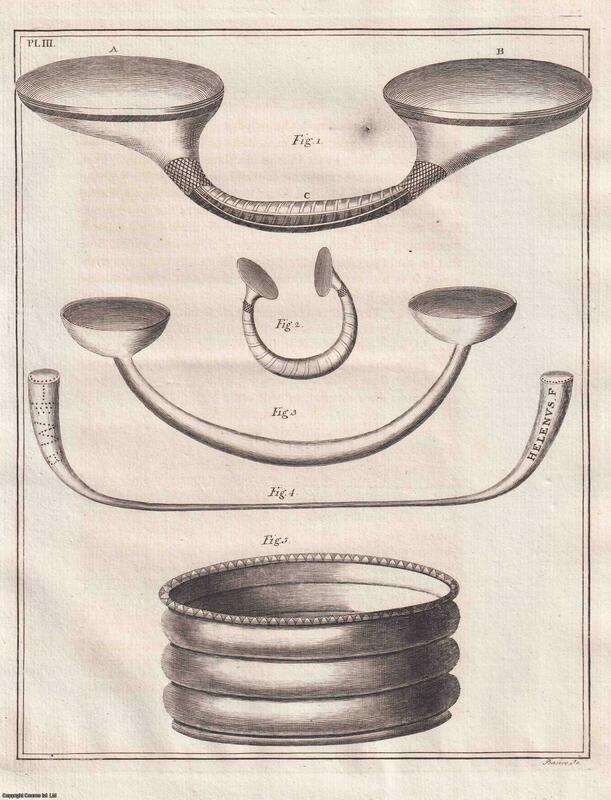 A rare original article from the journal Archaeologia, 1775. Archaeologia: or Miscellaneous Tracts relating to Antiquity. Volume 3, 1775. 1775. First Edition, Disbound. Very Good Condition. 4 pages + 1 plate, some foxing. Note; this is an original article separated from the volume, not a reprint or copy. Size: Quarto. Quantity Available: 1. Category: Archaeologia; Printed before 1800; Inventory No: 156685. Bronze Scabbard of Late-Celtic work found at Hunsbury Camp, near Northampton. A rare original article from the journal Archaeologia, 1890. Archaeologia: or Miscellaneous Tracts relating to Antiquity. Volume 52, Part 2. 1890. 1890. First Edition, Disbound. Very Good Condition. 2 pages with 1 illustration, some slight foxing. Note; this is an original article separated from the volume, not a reprint or copy. Size: Quarto. Quantity Available: 1. Category: Archaeologia; Inventory No: 157146. Archaeologia: or Miscellaneous Tracts relating to Antiquity. Volume 52, Part 2. 1890. 1890. First Edition, Disbound. Very Good Condition. 2 pages with 1 illustration, some slight foxing. Note; this is an original article separated from the volume, not a reprint or copy. Size: Quarto. Quantity Available: 1. Category: Archaeologia; Inventory No: 198426. A Charter of Barnwell Priory, from the Original in the Possession of Richard Gough, Esq. 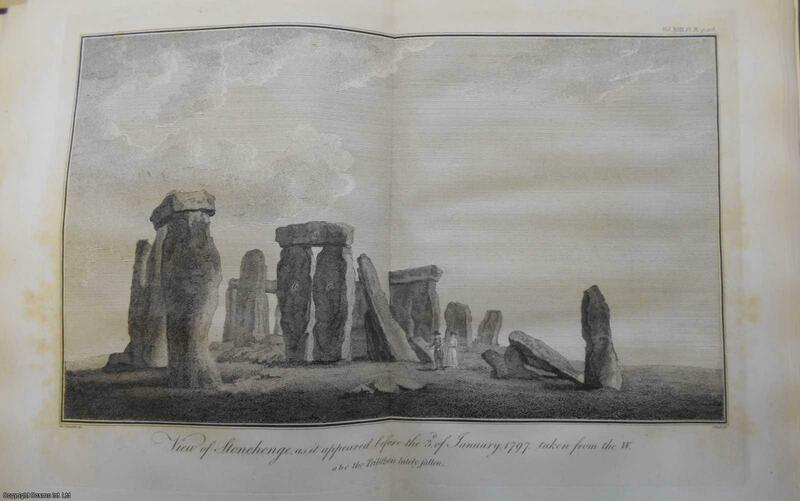 A rare original article from the journal Archaeologia, 1792. Archaeologia: or Miscellaneous Tracts relating to Antiquity. Volume 10, 1792. 1792. First Edition, Disbound. Very Good Condition. 3 pages with 1 illustration, some slight foxing. Note; this is an original article separated from the volume, not a reprint or copy. Size: Quarto. Quantity Available: 1. Category: Archaeologia; Printed before 1800; Inventory No: 156982. Charters relative to the Priory of Trulegh in Kent. A rare original article from the journal Archaeologia, 1834. Archaeologia: or Miscellaneous Tracts relating to Antiquity. Volume 25, 1834. 1834. First Edition, Disbound. Very Good Condition. 5 pages. Note; this is an original article separated from the volume, not a reprint or copy. Size: Quarto. Quantity Available: 1. Category: Archaeologia; Inventory No: 197672. Communication from William Chaffers, Jun., Esq., F.S.A., addressed to J.Y. Akerman, Esq., Secretary, accompanying the Exhibition of numerous Glass Vessels, and other Antiquities of the Roman Period, found at Nismes. A rare original article from the journal Archaeologia, 1852. Archaeologia: or Miscellaneous Tracts relating to Antiquity. Volume 34, 1852. 1852. First Edition, Disbound. Very Good Condition. 5 pages with 3 illustrations + 1 plate, some foxing. Note; this is an original article separated from the volume, not a reprint or copy. Size: Quarto. Quantity Available: 1. Category: Archaeologia; Inventory No: 197914. Copies of Original Papers, illustrative of the Management of Literature by Printers and Stationers in the middle of the Reign of Queen Elizabeth. A rare original article from the journal Archaeologia, 1834. Archaeologia: or Miscellaneous Tracts relating to Antiquity. Volume 25, 1834. 1834. First Edition, Disbound. Very Good Condition. 13 pages. Note; this is an original article separated from the volume, not a reprint or copy. Size: Quarto. Quantity Available: 1. Category: Archaeologia; Inventory No: 157944. Archaeologia: or Miscellaneous Tracts relating to Antiquity. Volume 25, 1834. 1834. First Edition, Disbound. Very Good Condition. 13 pages. Note; this is an original article separated from the volume, not a reprint or copy. Size: Quarto. Quantity Available: 1. Category: Archaeologia; Inventory No: 197667.